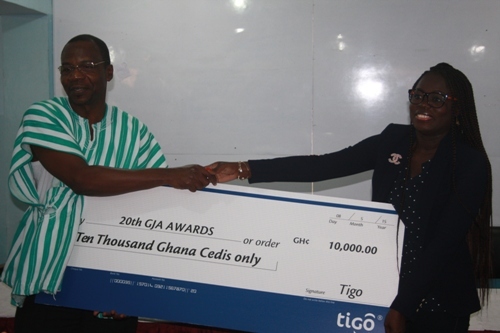 Telecommunications company, Tigo Ghana has presented a cheque of GHC 10,000 to support the online category of upcoming Ghana Journalists Association (GJA) awards. According to the telecommunication company, the aim to recognize and appreciate the contributions of journalists fueled the drive to support the 20th edition of the GJA Awards which is slated for August 15 at the State Banquet Hall. Speaking at the press conference to present the cash to the GJA in Accra recently, Gifty Bingley, Head of Corporate Communications and Corporate Social Responsibility at Tigo stated that her outfit was ready to support institutions such as the GJA to encourage the pursuit of excellence among journalists in the country. She stated that the Digital Journalism category was essential to Tigo because it provides data services which enable people to keep connected to family, friends and share information. GJA president, Dr. Affail Monney commended the Tigo for the kind gesture and called on corporate Ghana to demonstrate their appreciation for journalists’ contribution to society. “Many are those who look at our flaws and paint all of us with the same accusing brush. Yes, human we are so we have our own imperfections but our imperfections do not obscure that fact that majority of our members are doing well, they are exceling and their excellence is impacting meaningfully and positively in all dimensions of national life,” Dr. Monney said. He disclosed that this year’s GJA Awards which will have energy as a critical subject had been tailored to reward excellence which will motivate others to give off their best thus leading to the improvement of the media landscape. “Everything has been lined up to ensure that this event lives up to its billing as one of the best on the national calendar,” he noted. In another development, World Vision has signed a sponsorship agreement with GJA to support the association with a GHC 30,000 annual package to support the fraternity. The GHC 30,000 package would cover two training sessions for 25 reporters on Child Protection amounting to GHC 10,000, a sponsorship award for the best reporter on Child Protection worth GHC 10,000 as well as a GHC 10,000 to support the Award Ceremony.